I had a nice big post all thought out in my head, but it's going to have to wait a bit. The sentiment remains though, merry Christmas to all and i hope you enjoy your long weekend!! Maybe Santa will put some ice cream in your stocking! Update: It's the afternoon and my wife and daughter just finished fresh cookies for Santa. I couldn't help myself and decided to try and make another strawberry Christmas cookie sandwich, just like last year. It's kinda funny because last time I complained the Breyers Strawberry was dwarfing any sugar cookie taste. 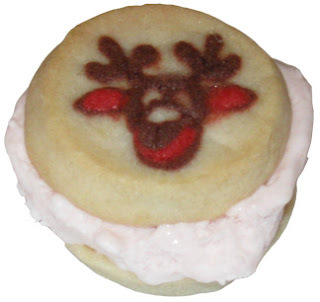 Well, the much more mellow Turkey Hill Strawberries and Cream is perfect between two fresh, warm sugar cookies. It was so good in fact, I made myself a second! I love Christmas cookies! Merry Christmas! :) Merry Christmas to you too. Thanks for all the great posts and all the general deliciousness!